By 1942, when the American military determined that a road was needed through northwestern Canada to Alaska, four proposed routes were considered. The route chosen in the end was an unofficial fifth proposed route that followed the already established Northwest Staging Route, a chain of airfields built through northwestern Canada. Hoge planned to follow an existing wagon road between Dawson Creek and Fort St. John, British Columbia, and between Whitehorse and Kluane Lake, Yukon, but he still needed to find a course for the areas in between. For this, Hoge relied on the knowledge, skills, and guidance of local guides and First Nations. The construction work involved 394 US Army officers and 10,765 enlisted men divided into seven regiments working on six sectors. Each sector had six construction crews and each crew was responsible for building 32 km of road. The pioneer road was finished on 28 October 1942, when the eastern and western sections met at Contact Creek, British Columbia. The Second World War was a period of continuing racial prejudice. Many officers in the US Army believed that African Americans should be kept out of combat missions and should not congregate in bases located near American towns. This made the option of using African American men for highway construction in a remote area appealing to the military. One of the main problems construction crews had to deal with was permafrost. Permafrost is caused when the vegetation that insulated the frozen ground was stripped and removed in order to make way for the road. 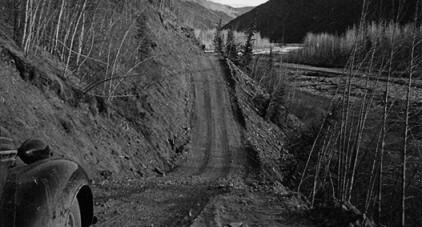 The pioneer road completed by the end of 1942 was still only a rough draft of the Alaska Highway and it quickly fell apart under use. The Public Roads Administration (PRA) essentially rebuilt the road in 1943, turning it into a two-lane, gravel highway, while also battling the same problems with drainage, washouts and permafrost. In general, the working conditions during the construction of the Alaska Highway were demanding for everyone involved. Some men arrived in the North after living their entire lives in the southern states. The early camps set up by the US Army were largely comprised of tents and movable buildings on skids. By 1943, there were semi-permanent housing and camp facilities for the contractors and PRA employees working on the Alaska Highway.